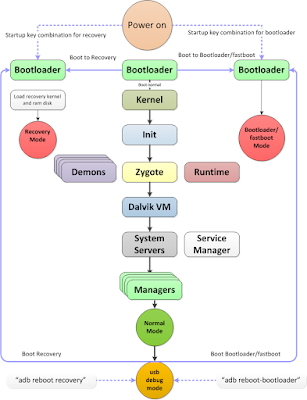 Tutorial What is Bootloader ? Android system itself is based on open source operating system. Android is available on a variety of different types of hardware, such as we know Android system is not currently developed in the mobile device, but watches are already being developed. So that each OEM has its own bootloader version of the specification for the hardware he used, so the firmware or on any rom on different devices. There are still many of us who do not know what it is bootloeder and here we try to discuss a little bit about what it is bootloader? Bootloader is a code that must be executed before the operating system boot normally, such as the BIOS on Windows operating systems. Basically, Android devices have a hard drive, sometimes we are familiar with the EMMC ic has several partitions are responsible store Android system files and all other application data. And for all of this partitioning, bootloader (or HBOOT) serves as a postal security inspectors responsible for checking and initializing the hardware and software to start boot up (on) normally. Why did Bootloder in lock / unlock the bootloader? Most bootloader locked and encrypted, including the Nexus device known as developer friendly. Manufacturers usually lock the bootloader to ensure the user to keep using the Android OS that has been designed specifically for that device. With a locked bootloader, it is unlikely that users with an easy to flash a custom ROM and attempt to force the install with another ROM that can invalidate its warranty period ..
As we know, HTC has given an official tool that can help users unlock the bootloader of the device. And other manufacturers are trying to do the same. Why do we have to unlock the bootloader? For users who are trying to open bootloader who definitely wants unlock bootloader Android device whether it's rooting, flashing, etc. Note: Unlocking the bootloader may void the warranty and also completely remove the internal memory data such as contacts, messages, apps, etc.